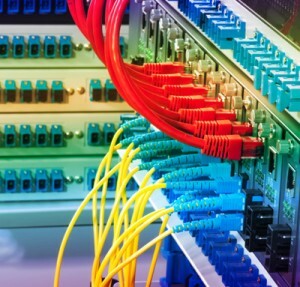 Many companies are upgrading to infrastructure cabling. As technology progresses, businesses look for solutions that will keep up with competition while also being low maintenance. Traditional point-to-point systems have become increasingly outdated, as they work less efficiently and create a mess of wiring to sort through. Today’s modern solution to commercial cabling is infrastructure cabling. This type of cabling has five main advantages over traditional cabling. An infrastructure cabling system is organized, which makes it easy to maintain. Rather than having to constantly call a big team to manage your data center cabling, you can instead maintain your infrastructure cabling with a small, knowledgeable staff. Infrastructure cabling works by unifying the data, voice, and video within your IT network. Having a unified structure such as this will minimize your maintenance costs and need for updates. Plus, additions, moves, and changes are easier to make within this type of cabling system. In the end, you save money on maintenance, which results in a higher return on investment. A higher bandwidth means more support for future applications your company may decide to add, such as multimedia or video conferencing. You’ll be able to add new features to your system without having to worry about your current system being interrupted. This makes infrastructure cabling future-proof: it won’t become dated after a few years. Infrastructure cabling consolidates your wiring system into a single infrastructure that transmits data in multiple formats, rather than several point-to-point systems that each handle a single type of format. This makes dismantling and moving your system a lot easier. Infrastructure cabling just looks a lot cleaner on the backend. For an example, check out the data center rack we recently reorganized for Iron Bow at Mortgage Bankers Association. A unified system functions more efficiently and is easier to manage because of its organization. This entry was posted on Monday, April 18th, 2016	at 5:26 pm	. You can follow any responses to this entry through the RSS 2.0 feed. Both comments and pings are currently closed.